Surprise!.. Superman is not really dead. (In fact he's busy training for the role right now). Henry showed up in a recorded message from the London set of Justice League, that was shown at CinemaCon this afternoon. It was part of the Warner Brothers presentation in Las Vegas, and his appearance had everyone talking.. Cast of "Justice League" just said hello from the set. Henry Cavill is there. So, yeah, Superman is in "Justice League." Probably not dead. Ended with Zack Snyder and the cast of JL on set. Henry Cavill was there so I guess he's back pretty quickly. That's right, Supes front and center all the way! WB did also confirm that a solo Batman film is on the way, and showed new Wonder Woman footage. You can read more over at The Hollywood Reporter and on Deadline's live blog below. P.S. Henry was at CinemaCon last year ahead of The Man from U.N.C.L.E. release, and it was an awesome day you may want to relive in our wrap. In BvS he was stabbed in the heart fighting against doomsday known for killing the man of steal in the comics. He's coming back for Justice League and I'm so excited. I have nothing against Batman and think Ben did a great job but I just feel that their pushing him more than Superman. Even Wonder woman got more screen time. Mr Snyder can we have more superman! he's a real hero to many and it's not fair that he's being held back from what he can really do. Is there footage from this? And I have to agree with the above. Batman is getting more from this DC universe than Superman. 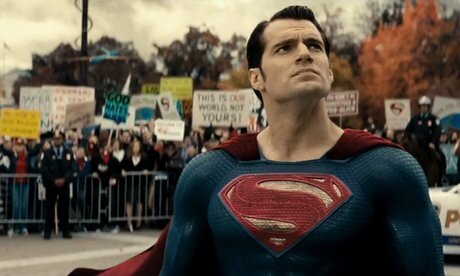 Henry is incredible as Superman and the best version we have to date. I just want to see the man of steal really let loose.